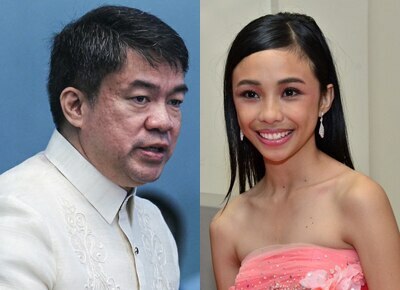 Senator Koko Pimentel and Maymay Entrata hail from the same province. "Maymay is a role model who will serve as a source of pride and inspiration for our young people aspiring to enter the world of entertainment,” the senator said, who is also from Cagayan de Oro. The senator added that “poverty is not a hindrance to attain fame and fortune as she bested a group that included celebrities and regular housemates." 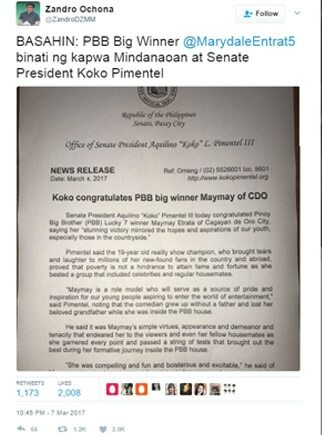 The announcement of PBB Lucky Season 7’s big winner was made last Sunday, March 8.